Home Parenting	The Introverted Child. Please Don’t Use the Shy Label. The Introverted Child. Please Don’t Use the Shy Label. The topic of introversion versus extroversion has always interested me. I was that kid on the playground who sometimes kept to myself because I felt like being quiet, observant. I watched as some of the other children walked around as if they were magnets, attracting every child they walked past. And as I grew into adulthood, I still leaned more into myself than others. I entered rooms quietly, oftentimes leaving no trace of myself when I left. Growing up, I heard I was shy. People in my life would apologize for me. My parents would sometimes apologize for me when I didn’t want to talk to adults, saying I was shy. I started to think of shyness as an affliction, wishing I somehow could be cured. The more people talked about it, the more I would feel my cheeks blush, and the more shy I would become. It overtook me at times. When I went away to college, I looked forward to starting afresh. I would be more outgoing because no one had already labeled me as quiet or shy. And it happened (to an extent). I learned to be extroverted when I wanted to be. I knew my introverted self would always be there to welcome me home. I thought back to this struggle once I became a mom of two. I knew my kids were not going to be the chatty ones who would talk a strangers ear off. In fact, they often decided they didn’t want to talk to people they knew really well. I found myself uncomfortable, as others tried to engage with them and they wanted nothing but to hide their faces in my shoulder. And then I started to remove the word “shy” from my vocabulary. I consciously decided not to label them shy, especially in front of others. They were introverts. Like me. And sometimes like my husband. Instead of talking, they studied their surroundings. I remember my dad observing my daughter’s affinity for studying people and places when she was only four months old. As an almost ten year old, she would be the person to ask for details during a crime investigation. She doesn’t miss a detail (even though she is much more extroverted now). My son remains much more introverted, but brave and courageous. But most importantly, he is comfortable in his own skin. As parents of more than one child, we find we have to parent each of our children differently. While my son responds to reasoning and logic during a moment of chaos (he really listens), my daughter needs physical assurance like hugs and tender touches (forget talking: it only exacerbates the situation). 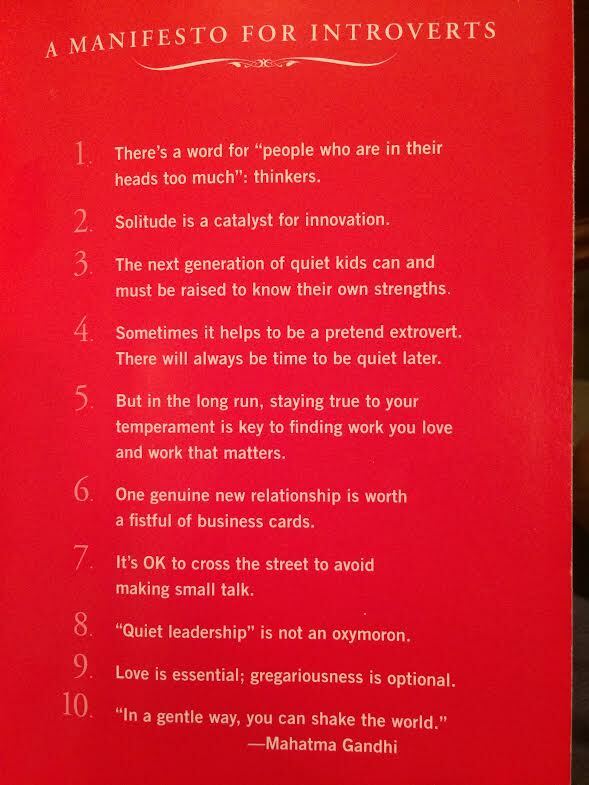 These are classically introverted/extroverted qualities. Recognizing that I now have two different children at times, one more introverted and one more extroverted, the book Quiet by Susan Cain called out to me (check out her TED talk here). Susan and her research not only spoke to me as a parent, but spoke to me as well. I now understand why I was so tired at the end of each day of my almost eight year sales career. I was doing the job of an extrovert. But that doesn’t mean I wasn’t effective (thanks for backing this up Susan). One of my managers remarked. “Your customers really like you because you genuinely listen to them. They not only like you, but they respect you”. The book Quiet dives into much greater detail analyzing career choices/fits/successes based on how quiet/observant or loud/outgoing one is. On a side note, I decided to go into sales to break out of my comfort zone. 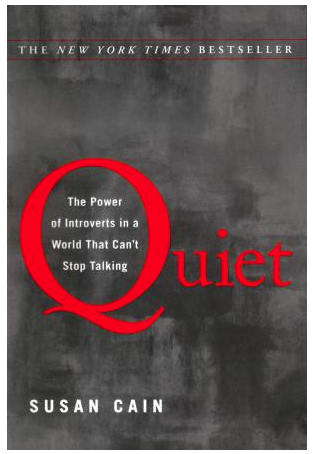 I don’t think Susan wrote the book Quiet with the intention of it being a parenting manual. However, she does recognize the importance of her research in parenting. I absolutely see the book as a valuable resource in my determination to raise my children with confidence. “Is something wrong with me?” This is a question many introverts have asked themselves or others. No. NO NO NO. Introverts are not antisocial oddballs. Extroverts do not deserve all the rewards for their pro-social behavior. But in the world we live in, we tend to celebrate the extroverts and forget to celebrate our introverts. As parents, we notice the kids with exuberant personalities. Everyone notices the high-fiving and chest bumping kids on the sports field. We don’t always see the kids in the background who were key in making important plays that helped win the game. That introverted kid has persistence as one of his greatest strengths. He thinks before he reacts. That child is just as important to a soccer game win as the outgoing kid, who has amazing reactiveness. I am not saying one is better than the other. And I am sure as heck not saying one is worse than the other. They are both valuable contributors and the world needs them both (on the field, in schools, in business, in politics). So coaches, please don’t think the quiet kid is there to keep the bench warm. Teachers, don’t overlook the deep thoughts of your thinkers. Parents, respect your child’s social needs. I wish it didn’t take me more than half my life to not fight my own nature, who I am. I want all kids to embrace who they are, to be embraced for who they are, and to stay true to their nature. If you have apologized for your child’s shy behavior, please stop. If you are frustrated that your child isn’t consistently outgoing, be patient, she may need some quiet time. It’s okay. Our children’s temperaments are innate, as are ours. Introverted and extroverted traits start to make themselves known in infants and toddlers. As we age, these traits are are then shaped equally by our environment. 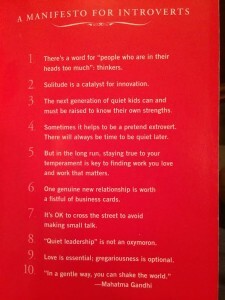 If you are fascinated by your child’s personality, definitely pick up the book Quiet. To quote the author Susan Cain, “The secret to life is to put yourself in the right lighting. For some it’s a Broadway spotlight; for others, a lamplit desk. [For the introvert] Use your natural powers—of persistence, concentration, insight, and sensitivity—to do work you love and work that matters. Solve problems, make art, think deeply”. She goes on to say that if your calling requires some extroverted qualities, then seek training and guidance to become stronger in those areas. Her advice reminds me of the support I have sought for my kids to help them overcome their fears, their insecurities. Be present for your children and support who they are. If we try to change them into who we want them to be, anxieties will only increase and they will think something is wrong with them. As a mom, that just hurts my heart. Here’s to loving everyone, from the exuberant popular kid to the quiet builder. We need them all to create a more harmonious world. Are you Ready for Open House? Is “America’s Worst Mom” Coming to Charlotte? I am an extrovert married to an introvert. Knowing and loving him made me a much better teacher for introverted students. Classroom discussion are tough for introverts, often a conversation among the 3 or 4 fastest blurters in the room. When I began to use a homework blog, where students could share their observations the night before a discussion, my introverts found their comfort zone and dazzled us with their insights.